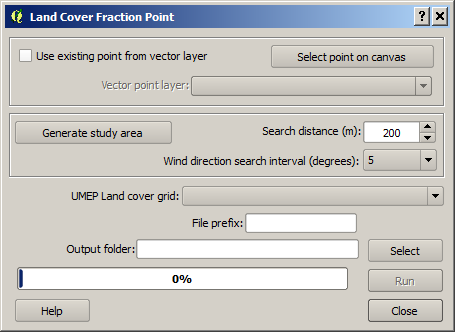 The Land Cover Fraction (Point) plugin calculates land cover fractions required for UMEP (see Land Cover Reclassifier) from a point location based on a land cover raster grid. A land cover grid suitable for the processor in UMEP can be derived using the Land Cover Classifier. The fraction will vary depending on what angle (wind direction) you are interested in. Thus, this plugin is able to derive the land cover fractions for different directions. upper Select a point on the map canvas by either clicking a location or selecting an existing point from a point vector layer. middle Specify the area of interest where the morphometric parameters are calculated. Set the search interval in degrees. lower Specify the input data regarding land cover fraction raster as well as specifying output and for running the calculations. Click to create a point from where the calculations will take place. When you click the button, the plugin will be disabled until you have clicked the map canvas. Select if you want to use a point from a vector layer that already exists and is loaded to the QGIS-project. The Vector point layer drop down list will be enabled and include all point vector layers available. This button is connected to the Search distance (m). When you click it, a circular polygon layer (Study area) is generated. This is the area that will be used to obtain the land cover fractions. A integer raster land cover grid (e.g. geoTIFF) consisting of the various land covers specified above. Where the result will be saved. anisotropic results: land cover fractions for each wind direction as specified are included. isotropic results: all directions are integrated into one value for each land cover fraction.